Ducking his responsibilities, Richie goes down to Professor KeenBean’s lab (you have to just accept these names and move on) to establish the invention of a wishing machine. Next we introduce the VanDough family, and their evil son Reggie. Seriously, the kid is evil from minute one. 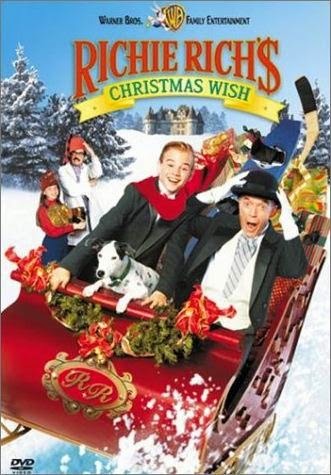 Reggie finds a ‘universal remote’ at the Rich family mansion and uses it to derail, somewhat literally, Richie’s ceremonial Christmas trip to bring presents to the orphanage. The fancy motorized sled tears through town destroying property and presents, and everyone blames Richie for losing control of the vehicle. In despair, he wishes to have never been born… while sitting by the wishing machine. Not really great at spacial awareness, this kid, considering how surprised he is by what happens next. He gets sucked through the machine into a parallel world where Reggie somehow manipulated everyone so that he could become the Rich’s son and then take over their fortune and business. It’s not plausible, but none of this has been plausible so far. We get that seemingly important call-back where Richie finally believes that he actually wished himself into a different reality when his special Christmas tree doesn’t exist. Richie steals back his dog, who trusts him for some reason, and this sets off a town-wide manhunt for the dognapper. A series of somewhat repetitive chase sequences later, and Richie manages to convince his old butler (now a roadie), the Professor, and his friends to help him fix the world. Namely, by stealing a giant dinosaur wishbone from a museum, in order to repair the wishing machine. They do this, the machine is briefly stolen away by Reggie, who makes the much more sensible wish of flight, and the kids end up in jail, only to be saved by the dog and the butler’s bandmates from earlier. Of course they get to the machine just in time and Richie wishes everything back to normal. When he wakes up, some unspecified amount of time has passed, because everyone in town was worried sick about Richie. There is no follow-up to the whole original plot line with the runway sleigh and blaming Richie for the lost presents for the orphanage. Not even a line. So I guess the takeaway is that ‘I’ll run away, and then they’ll all be sorry!’ is a viable strategy. This isn’t, as I said, a truly terrible film. Just mediocre to bad. There are a lot of strange matting/blue-screening choices in scenes where it doesn’t make sense, but other than that the production is pretty polished. The acting is over the top, but it’s clearly a consistent choice, and Richie manages to eke out a hint of sympathy despite all the situations being stupid. The ending is odd and lacks quite a bit of resolution. Wikipedia tells me that there is an alternate edit sometimes shown on TV that rectifies this. How incredibly bizarre that it wouldn’t be on the DVD release! This probably entertained kids with nothing to do when it came out, and that’s all it had to do to be a success. I have one more positive thing to add: despite not actually being any good, it was much better than we expected.